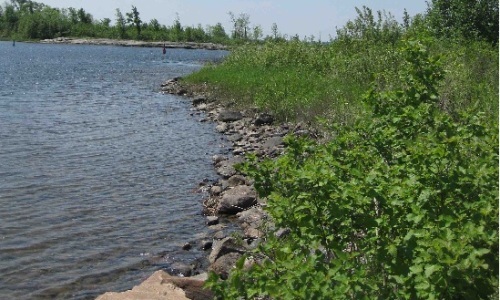 The Russell Reserve is located within the Port Severn Wetlands Natural Area. The area is located in the transition area, often referred to as the “contact zone”, between the Precambrian bedrock that defines the Canadian Shield and the Paleozoic bedrock that characterizes southern Ontario. This creates an interesting assemblage of species at the edges of their southern and northern ranges, creating an area with high biodiversity in vegetation community types, flora and fauna. The region has no existing protection and is almost entirely privately owned. The Russell Island property is representative of the area and contains extensive coastal wetlands, some of which provide habitat for a provincially rare endemic species, Stiff Yellow Flax. The property includes a young White Birch forested central area which has areas of high shrub thicket such as rose and alder. The eastern shoreline is more sheltered and includes several small bays of exposed rock barren and narrow-leaved sedge marsh. One of these bays supports a healthy fish and turtle population, providing habitat for feeding and spawning.